If a network is not secure, how valuable is it? 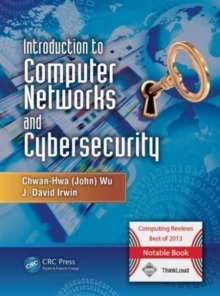 Introduction to Computer Networks and Cybersecurity takes an integrated approach to networking and cybersecurity, highlighting the interconnections so that you quickly understand the complex design issues in modern networks. This full-color book uses a wealth of examples and illustrations to effectively connect the principles of networks and networking protocols with the relevant cybersecurity issues. Get the Fundamentals of Internet Architecture and the Protocol LayersOrganized into six parts, the book walks you through the fundamentals, starting with the way most people first encounter computer networks-through the Internet architecture. Part 1 covers the most important Internet applications and the methods used to develop them. Part 2 discusses the network edge, consisting of hosts, access networks, LANs, and the physical media used with the physical and link layers. Part 3 explores the network core, including packet/circuit switches, routers, and the Internet backbone, and Part 4 examines reliable transport and the management of network congestion. Learn about Malware and Security SystemsBuilding on the concepts and principles, the book then delves into state-of-the-art cybersecurity mechanisms in Part 5. It reviews the types of malware and the various security systems, made up of firewalls, intrusion detection systems, and other components. Crucially, it provides a seamless view of an information infrastructure in which security capabilities are built in rather than treated as an add-on feature. The book closes with a look at emerging technologies, including virtualization and data center and cloud computing unified communication. Understand Cyber Attacks-and What You Can Do to Defend against ThemThis comprehensive text supplies a carefully designed introduction to both the fundamentals of networks and the latest advances in Internet security. Addressing cybersecurity from an Internet perspective, it prepares you to better understand the motivation and methods of cyber attacks and what you can do to protect the networks and the applications that run on them. Pedagogical FeaturesThe book's modular design offers exceptional flexibility, whether you want to use it for quick reference, self-study, or a wide variety of one- or two-semester courses in computer networks, cybersecurity, or a hybrid of both. Learning goals in each chapter show you what you can expect to learn, and end-of-chapter problems and questions test your understanding. Throughout, the book uses real-world examples and extensive illustrations and screen captures to explain complicated concepts simply and clearly. Ancillary materials, including PowerPoint (R) animations, are available to instructors with qualifying course adoption.